Action from the game between Netherton Hawks Under 13s and Deeping Rangers Blue. Deeping won 3-0. Park Farm Pumas Black Under 14s fired a warning to their Division One rivals on Sunday with the biggest win on the opening day of the Junior Alliance League season. 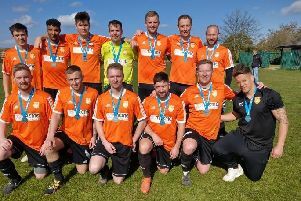 The city side have been promoted to the top tier after romping to the Under 13 Divisoion Four title last season and the early signs are they’ll cope admirably at the higher level. They started with a whopping 17-2 thrashing of Peterborough Northern Star Black with eight players figuring on the scoresheet. They were Lacko Stanislav (3), Daniel Sot (3), Kadan Al-Gharabally (2), Gediminas Kozik (2), Robert Facuna (2), Dominik Chrominski (2), Joseph Marshall (2) and Ben Lane. Leverington Sports Under 12s, Malborne United Under 12s, Holbeach United Under 13s and Spalding Blue Under 13s also reached double figures. Leverington chalked up a 14-3 win over Oundle Town in Division Three with Declan Foster and Ryan Benton both helping themselves to five goals, while Malborne beat Spalding Orange 12-0 in Division Four with Lewis Driscoll netting four times and Luke Rymill three. Holbeach were 12-0 winners over Wisbech St Mary in Under 13 Division Two, and in Division Three Spalding Blue beat Rippingale & Folkingham 10-2. Stars of the show for Spalding were two of the substitutes. Pedro Carneiro and Sam Booth both came off the bench to fire four goals apiece. Keane Bates was another super sub. He hit a hat-trick for Park Farm Pumas Red Under 12s in their 7-3 win over Glinton & Northborough Black.